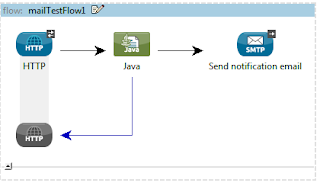 Sending Email using mule is very easy by using SMTP Outbound End Point . Here is a sample mule application to send mail. To use gmail network to send mails , you have to use gmail smtp connector , otherwise you will get tls errors . <mule xmlns:smtp="http://www.mulesoft.org/schema/mule/smtp" xmlns:http="http://www.mulesoft.org/schema/mule/http" xmlns="http://www.mulesoft.org/schema/mule/core" xmlns:doc="http://www.mulesoft.org/schema/mule/documentation" xmlns:spring="http://www.springframework.org/schema/beans" version="CE-3.3.1" xmlns:xsi="http://www.w3.org/2001/XMLSchema-instance" xsi:schemaLocation="
<http:inbound-endpoint exchange-pattern="request-response" host="localhost" port="8081" doc:name="HTTP"
org.mule.api.endpoint.MalformedEndpointException: The endpoint "smtp://yourEmailAddress@gmail.com:pass@smtp.gmail.com:587" is malformed and cannot be parsed. If this is the name of a global endpoint, check the name is correct, that the endpoint exists, and that you are using the correct configuration (eg the "ref" attribute). Note that names on inbound and outbound endpoints cannot be used to send or receive messages; use a named global endpoint instead. it is a known Bug . Here is the component class where you can set your email body . Setting mimeType on smtp outbound endpoint will have no impact , unless you set contentType property on smtp connector.